The Prophets of Baal of Babylonian Talmud, AKA Talmud Bavli, along with their Telly Tubby Talmudic Tinky Winky Televangelical TBN (The Babylonian Network) Proselytes (Evangelical Noahide Anti-Christ) make all current events fit into the Fables of the jews so called prophecies. Then when the Sanhedrin “Reveals” their Moshiach ben David, AKA, the Son of Perdition, they will tell their global proselytes “SEE all of our prophecies have come to be true, Behold the TRUE Messiah of the jews……….and many will flock to that Man of Sin’s feet to worship Him…for they already bow unto their master race the jews religion unto Lucifer…..
Actually GOG is Sanhedrin of Chabad Lubavitch, Dan, Samaria, The North, and it is they who attack True Spiritual Israel, them who are in faith of Christ Jesus, to slay wonderfully in the name of Noahide Peace……..These are Amalek…Do not b e deceived. At the festive meal that concluded the holiday of Simchat Torah earlier this week, Rabbi Sholom Berger, also know as the Mishkolitz Rebbe, spoke about the imminent arrival of the Messiah (Moshiach False Christ) and the War of Gog and Magog. He revealed a surprising interpretation that challenges the usual understanding of where the war will take place, offering reassuring advice as to what we need to do in these darkened times. 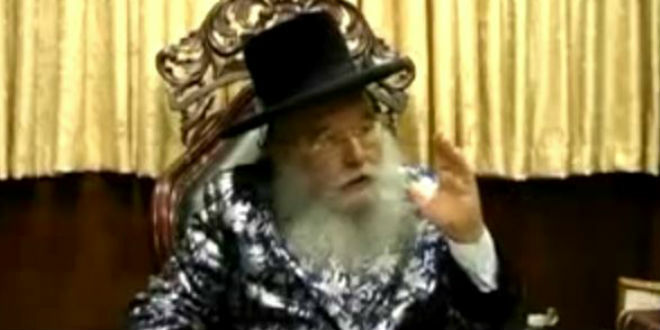 The Mishkolitz Rebbe has made headlines before with his revelations. At the end of 2011, he announced that no military strike on Iran was necessary since then Iranian president, Mahmoud Ahmadinejad, who was threatening Israel with nuclear destruction, would soon fall from power. The Rebbe compared Ahmadinejad to the Biblical villain of Haman, whose fall from power was swift and dramatic, as record in the book of Esther. Jesus is the Only Christ the Lord God Almighty, and Every Eye shall see him come in the clouds with Great Glory, even these who pierced him…….and EVERY KNEE will Bow ! Beware jews of Israel !